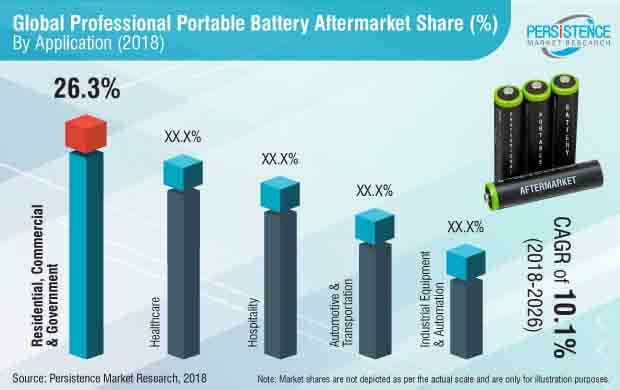 Persistence Market Research (PMR) analyzes the Professional Portable Battery Aftermarket in its new publication titled ‘Professional Portable Battery Aftermarket: Global Industry Analysis 2013–2017 and Forecast 2018–2026’. This study provides data for 2018 along with the forecast for the period 2018–2026. The main objective of the professional portable battery aftermarket report is to identify dynamics in the market and provide recent updates and insights affecting the various segments of the global professional portable battery. To provide a better understanding of the professional portable battery aftermarket, the report also includes the analysis of drivers, restraints and trends in all six regions/countries, namely North America, Latin America, Europe, SEA & Pacific, China and MEA, which influence the current professional portable battery aftermarket scenario as well as are capable of affecting the future status of the global professional portable battery aftermarket over the forecast period. To understand and assess the Professional Portable Battery aftermarket opportunities and trends, the global Professional Portable Battery aftermarket report has been categorically split into different sections based on market segmentation – by battery type, by application, by distribution channel, by end users and by region. The professional portable battery aftermarket report starts with the market overview and provides market definition and taxonomy along with value chain, pricing analysis, drivers, restraints and trends in the market. The sections that follow include the global professional portable battery aftermarket analysis by battery type, by application, by distribution channel, by end users and by region level analysis. All the above sections evaluate the aftermarket on the basis of various factors affecting the aftermarket size. Each section discusses the qualitative and quantitative aspects of the global professional portable battery aftermarket. To give a brief idea about revenue opportunities from battery type, application, distribution channel, end use and region segments, the report also provides market value, absolute $ opportunity and total incremental opportunity for each segment over the forecast period (2018–2026). In the final section of the professional portable battery aftermarket report, a competitive landscape of the professional portable battery aftermarket has been included to provide report audiences with a dashboard view categorized on the basis of providers present in the value chain, their presence in the professional portable battery aftermarket market and key differentiating factors and strategies. The primary category of providers covered in this professional portable battery aftermarket report include professional portable battery manufacturers. This section is primarily designed to provide clients with an objective and detailed comparative assessment of the key providers specific to a market segment in the value chain of the Professional portable battery aftermarket. Report audiences can gain segment-specific vendor insights to identify and evaluate key competitors on the basis of the in-depth assessment of their capabilities and success in the professional portable battery aftermarket. Detailed profiles of providers have also been included under the scope of the report to evaluate their long- and short-term strategies, key offerings and recent developments in the professional portable battery aftermarket. For the professional portable battery data analysis, we have considered 2017 as the base year, with market numbers estimated for 2018 and forecast made for 2018–2026. To calculate the market size, the report considers the weighted average price of Professional Portable Battery based on battery type, such as alkaline, lithium ion and nickel based & others across key geographies on a country basis. The forecast assesses the total revenue (US$ Mn) and volume (Mn Units) of the global professional portable battery aftermarket. To deduce market value size, the cost of each connectivity has been considered. In order to provide an accurate forecast, we started by sizing up the current market, which forms the basis of how the global Professional Portable Battery is expected to develop in the future. The critical market data, including the base number and segment splits, has been devised through in-depth secondary and primary research. This data was then triangulated on the basis of different verticals, considering both supply side and demand side drivers and other dynamics of the various regional markets along with the primary interviews of manufacturers and industry experts operating in the global Professional Portable Battery. The forecast presented in the report evaluates the actual cost of Professional Portable Battery and the cost by brands in the global Professional Portable Battery over the forecast period. We have also analyzed the different segments of the global Professional Portable Battery in terms of basis point share (BPS) to understand every individual segments’ relative contribution to market growth. This detailed level of information is important for identifying the various key trends governing the global Professional Portable Battery. The report also analyses the global Professional Portable Battery on the basis of absolute dollar opportunity. This is usually overlooked while estimating the market forecast. However, from a sales perspective, it is essential to identify the potential resources in the Professional Portable Battery aftermarket. PMR has developed a market attractiveness index to understand the key segments in terms of their performance and growth in the global Professional Portable Battery. This market attractiveness index would help clients identify real market opportunities in the global Professional Portable Battery Aftermarket. The final report is a collection of crucial information fetched through extensive research. The primary and the secondary research play a crucial part in gauging the evolving market behavior within the forecast period. The aftermarket for Professional Portable Battery is dependent on various factors, such as manufacturing, purchasing power parity, industrialization, urbanization, electronic industry and population & employment growth rate across the globe. Professional portable batteries, also known as portable batteries, are energy storage cells that are used for power transmission. A professional portable battery is used in electrical and electronic devices for the supply of energy/power. In our research scope, we have considered primary as well as secondary professional portable batteries, including AA type, AAA type, C type, D type, Microcells and 9V batteries. Batteries used in smart phones, laptops and battery packs have not been considered. In this professional portable battery aftermarket report, we have considered portable batteries that are used in healthcare, residential, commercial, government, industrial and automotive applications. We have used bottom up approach to crunch the aftermarket size for different applications in the professional portable battery aftermarket. The residential, commercial & government segment is expected to prevail in terms of both volume and value share. It is also projected to be a high volume segment with a high growth rate. Along with healthy growth and outstanding sales volume, the residential commercial & government segment is emerging to be profitable for key manufacturers & suppliers in the professional portable battery aftermarket. Wireless and portable devices are preferred over wired devices and thus, manufacturers are trying to reduce the production cost of their products to increase their sales as well as presence in the market. This factor will indirectly affect the aftermarket sales of professional portable batteries. With advancements in technology, companies are offering advanced wireless electronic solutions in developed countries. Many entry-level small and large scale players in the security solution market are offering products at competitive prices. This particular factor will enable customers to opt for updated security solutions, a trend that will affirmatively impact the growth of the professional portable batteries aftermarket. Regulations employed by government bodies that mandate the use of fire safety equipment to assess hazards in residential and non-residential areas are also expected to drive the growth of the battery operated smoke detector market, which in turn will positively affect the professional portable battery aftermarket. Increasing adoption of battery operated smoke detectors in commercial and industrial applications as a cost-effective solution for providing safety is also expected to contribute to the growth of the professional portable battery aftermarket. Moreover, attributing to the increasing number of accidents, fatalities and injuries in mining, construction, oil and gas and chemical industries, the adoption of battery operated smoke detectors has become a critical requirement. Among the restraining factors for the professional portable battery aftermarket are the rules and regulations being implemented by governments to save water. These regulations are expected to surge the demand for substitute products such as paper and toiletry. While water covers 70% of the earth’s surface, only 3% of earth’s water is fresh water, two-thirds of which is in the form of frozen glaciers and thus, not available for use. Also, the European policy that restricts the number of houses a person can own limits the number of bathrooms per house, which in turn limits the sale of battery-powered bath accessories. These factors are expected to hamper the growth of the professional portable battery aftermarket. The professional portable battery aftermarket is a consolidated market as organized players hold dominant shares and leading players have strong presence globally. Unorganized/Tier-2&3 players are estimated to hold approx. 31% to 36% share in the global aftermarket and are also expected to generate approximately US$ 1,000 Mn in terms of value in the professional portable battery aftermarket. What is the historic (2013-2017) scenario of the professional portable battery aftermarket? Which type of batteries are dominate the aftermarket? What are the main factors that influence the aftermarket? What are the key trends and development in the professional portable battery aftermarket? What are some of the principal forecast and macroeconomic factors that affect the growth of the aftermarket? How competitive is the aftermarket and market share analysis of the top players? What are the important key challenges, opportunities and improvement factors for aftermarket players? How are key player expected to drive the market in the next 5 to 8 years? Some of the key market participants reported in this study of the global professional portable battery aftermarket are Panasonic Corporation, Energizer Holding Inc., Varta AG, Maxell, Ltd., Murata Manufacturing Co., Ltd., Suzhou South Large Battery Co., Ltd., BE-POWER GmbH, Duracell Inc, EVE Energy Co., Ltd., Shenzhen Pkcell Battery Co., Ltd., The Swatch Group (Renata SA) and Guangzhou MaiSheng Energy Technology Co., Ltd., among others. Guangzhou MaiSheng Energy Technology Co., Ltd.
Suzhou South Large Battery Co., Ltd.
Shenzhen Pkcell Battery Co., Ltd.